High highs . . . Low lows. I don't think I've ever gone from so happy to so sad in such a short period of time. We were down by 1 point with 1 second left. We had been hoping for a field goal, but time ran out and we weren't in range. A Hail Mary was the only option. The only thing that was running through my head was, "These situations never seem to work out for BYU. I'll assume we're going to lose the game. That way, I'll be expecting it and maybe my disappointment will be minimal when that's what actually happens . . ."
I don't think I've ever seen quite the scene that ensued when Mitch Mathews brought down that Hail Mary TD pass from Tanner Mangum. I think I just sat there with my mouth hanging open for at least 5 seconds before I even realized what had happened. Everyone was running & screaming. It's probably good that one of the BYU TV employees had the presence of mind to go up front and prevent people from running into the giant TV screen & other equipment so it wouldn't get damaged in the mayhem. Spencer Linton & Brian Logan ran into the room screaming and hugging each other. David Nixon & Michael Alisa were high-fiving the crowd. The woman next to me (a complete stranger) grabbed me in a bear hug. Pure joy! The refs reviewed the play (during a brief moment of silence), confirmed the TD, and then the room erupted again. We had actually won. I just kept saying "WOW" to myself over and over again... Did that really just happen? Things calmed down a little bit, and the post game show started filming. And then joy turned to despair. Taysom Hill is out for the year with a broken foot. What the?! Twitter traffic & the game commentators had just been reporting a sprain. It didn't even look like he'd done anything to it . . . And he came back and played on it . . . they wouldn't let him play on a broken foot, right? Tyler Haws magically healed his badly sprained ankle in like a week . . . those BYU trainers could do the same thing for Taysom, right? There's no way he has a broken foot. I'm still in shock. Are they really sure he has a broken foot? Really, really sure??? He's done. Yes, he probably could get a medical redshirt, but I don't think he will. It would just be too much to handle coming back from 3 season-ending injuries. He's got a good non-football career ahead of him, and I think he'll take it. People on Twitter & fans at the broadcast building were saying we need to stop complaining about not having Taysom anymore and embrace Tanner Mangum as the new leader of the team. We need to "move on" and forget about it . . . Really? You just want to forget about Taysom? I never want to forget about Taysom. Maybe that's not what they meant, but it hurts that people think we can't even mourn his loss. Yes, we should embrace Tanner as the new BYU quarterback, and I hope he'll do great things. But at the same time, my heart hurts for Taysom. So much. At the Cougar Kickoff a few weeks ago, I heard a fan say to Mangum, "Is it ok that I hope you don't play very much this year?" Tanner laughed & replied, "Yeah, that's totally fine! I hope I don't, either! I'd be ok with just taking a few snaps in the 4th quarter when we're up by like 30!" I'm sure on some level, he's excited to get this opportunity. He'll likely be the starter for 4 straight years, and if what he pulled off today is any indication of his potential, those will be a great 4 years! But Taysom . . . Some fans on Twitter who were at the game said he was "crying like crazy". I feel so bad for the guy. He had so much potential, and he hardly got to use any of it. I never imagined this would happen, as pretty much the whole offensive strategy was built on protecting him. It's yet another "freak injury" that will likely end his football career way too soon. Because of the Taysom news, I'm having a hard time even being happy about the win today. I almost feel bad about tweeting or sharing anything about the amazing win or even feeling happy because of the news that came afterward. I know it would be so much worse if the Hail Mary had failed and we had lost, but I'm really bummed. I'm going to the game in Michigan in a 3 weeks, and I've been so excited for THREE YEARS. I still am excited, but one of the main things I was excited about was seeing both Taysom and Jamaal play in the Big House in their senior seasons. And now neither one of them will be there. I'm sure it will still be fun and a good game, but I'm just plain depressed now. 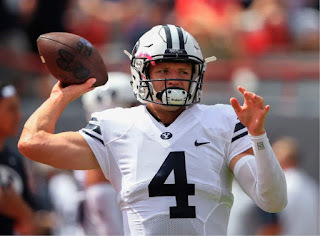 I really hope Taysom's going to be ok . . . and not just physically. He doesn't deserve this. It's times like this that I really don't understand that whole "trials will work out for your good" thing. I mean, we beat Nebraska, a quality opponent, on national TV, in amazing fashion! But I just can't be happy about it . . . because the loss in this game was so much more than the gain. If I could trade the win for Taysom's health, I'd do it in a heartbeat. I'm hopeful that the Cougars can still pull out a good season, but they've got to make a lot of adjustments, and they've got to make them fast. Now we're down 3 of our best players (including Travis Tuiloma, who is out for 4-6 weeks with a knee injury) and we're going to have to make some major changes on both offense and defense . . . and Boise State comes to town in only 7 days. Not to mention the emotional strain that I'm sure is hitting the team hard from losing Taysom AGAIN. I'm a little overwhelmed just thinking about it. Sigh . . .
Because I don't want to end on a sour note, even though that's how I feel, let's watch the Hail Mary play again, followed by Bronco celebrating & Terenn Houk hugging the ref. :) Let's hope this is a sign of great things to come!